This is a list of common questions on Thai Visas. There are some confusion about the Thai visa process and system. If you have any questions that is not covered in this article, please send us an email or contact us via the chat messenger. Do you need to leave Thailand every 90 days with a marriage visa? The answer is yes and no. It depends on the type of visa that you have. If you have a multiple entry Non immigrant “O” visa based on a marriage to a Thai citizen, the visa will allow you to enter Thailand multiple times during the year but you are only allowed to stay a maximum of 90 days each time you enter the country. However if you financially qualify you can file for a full year extension of your Non-immigrant “O” Visa where you only have to report to the immigration authorities every 90 days. In order to qualify for a one year extension, you will have to show a minimum of 400,000 baht in a Thai bank account or at least 2 months prior to the extension or produce a monthly income of at least 40,000 baht. Am I blacklisted in Thailand? If you have committed a serious crime in Thailand or was previously removed from Thailand for visa then your information is probably in the government system. There is a good possibility that you will have a very difficult time obtaining a new visa to enter Thailand. We do not have access to the Thai government databases. You will have to apply for a visa in your home country to see determine whether you have been placed on an inadmissibility list. What type of visa can I get with a Thai wife? There are a couple of options for you. You can obtain a tourist visa or a Non-Immigrant “O” and then extend the visa when you enter Thailand. The extension can be filed as a Thai immigration office in Thailand. Our offices in Chiangmai, Pattaya, Bangkok, and Phuket can assist you. How do I extend my visa in Thailand? This depends on what type of visa you have. If it is a 2 month tourist visa then you can go to any immigration office and for a fee of 1,900THB they will extend your Thai visa for another 30 days. In addition, the marriage visa can be extended for 1 year. A retirement visa or Thai “O-A” visa can also be extended in Thailand for 1 year if you meet the financial requirements of the visa. An educational visa can also be extended in Thailand but you will have to show evidence that you are attending classes. If you obtained your educational visa based on enrollment in a language school, the immigration officer may you’re your Thai language skills. If it is from a university they will want to see the exam results to extend the visa. How many time can I apply for tourist visa? Do I need it in my home country or in any country? The single entry visa how many time can be extended? Another question about elite visa is that legal in Thailand? Should I consider that if I want to stay long in Thailand without work? Below are the responses to your inquiries. ​How many time can I apply for tourist visa? — The number of tourist visa applications will depend on the discretion of the consul who will review your application. Do I need it in my home country or in any country? –Generally, you are advised to apply for the visa at the Thai embassy or consulate in your home country. The single entry visa how many time can be extended? — The visa can be extended once. ​– ​It would be recommended that you get in touch with a Thai embassy or consulate near your residence to inquire about the applicable visa for your case. My Year Visum expires January 3rd. I would like a new 1 year Visum applying for in Thailand and saving a flight to the Netherlands. The renewal or extension of your visa will totally depend on the type of visa that you have or you wish to obtain and if you have met the requirement. Please tell us more about your visa or expound your inquiry. If I want to visit Vietnam from Thailand, do I need to present a return flight back to my country, South – Africa? Or back to Thailand on departure? Or can I book a one way to Vietnam? Kindly get in touch with Vietnam immigration. We do not have information about their immigration rules. I have a 60 days tourist visa that can be extended 30 days by immigration. What do I need to do when I leave Thailand and return to get another 30 days not 15? Depending on the passport you hold, you can obtain a 30-day stamp if you arrive by air at the immigration checkpoint at the airport. Thanks for your answer. Do you mean when I enter first time or when I return after using my visa? I have an American passport. For American passport holders, you can enter on visa exemption for 30 days each time you enter. This applies once you exit Thailand after your 60-day tourist visa plus 30-day extension expires and you re-enter Thailand. I am American planning to fly to Thailand on 60 days tourist visa and 30 more by immigration. How can I leave and return for 39 days more? After your first trip on a tourist visa, you can exit and re-enter on visa exemption for a maximum of 30 days based on your passport. You can then apply for an extension on the 30-day stamp at immigration. How can I get a Thai police clearance or statement from the Thai immigration authorities? Since I had 2 days overstay in Thailand in January 2016. The Australian government is asking me for that when applying for my Australian working visa. (I am currently in Australia). A police clearance must be obtained from the Thai Royal Police in Thailand. 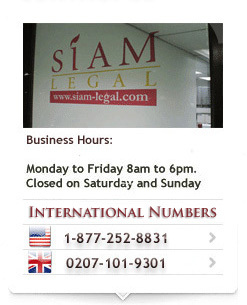 You may send an email to info@siam-legal.com should you need assistance to obtain the document while you are in Australia. I am holding Bangladeshi Passport. I have a Re-entry Business Visa where stay is valid till 12th November. Now I have to attend my official project works at Bangkok from 6th to 11th of December. How many days maximum I can apply to extend it? Kindly get in touch with the immigration office in Thailand to check if it would be possible for you to apply for an extension on the same Business Visa. Otherwise, you will need to apply for a new visa from the Thai embassy or consulate in your home country or country of residence. Can I extend a 15-day land-border VOA (Visa on arrival) for another 30 days? Or does it only apply to obtained 60 days tourist visas? A visa on arrival can only be extended to 7 days. If you wish to stay for a longer duration, you can apply for a tourist visa before traveling to Thailand. I have a multiple entry Non immigrant “ED” Visa until 9 March 2017. Can I extend after that time? What can I do after that time? Applying for an extension will depend on whether or not you are able to meet the requirements of the immigration office in your current residence in Thailand. It would be best that you get in touch with an immigration office for information about extending your visa.